Musings of The Mom Jen: Posing for the "Card"
Home > Family, holidays, Photo > Posing for the "Card"
The season is upon us and yep, i'm stressed as usual. Bills. Shopping. Decorating. Bills. Shopping. Wrapping. Giving. Receiving. I promised myself that I wouldn't be stressed this year with THE photo. We wanted a special locale. Didn't find it. We wanted a special time of day. K was napping. We wanted different, spectacular, dreamy, and perfect. Doesn't exist. So we went with a quickie shoot. We only had two hats. K was wearing pink. She cried when I put a brush to her hair. Brother dressed himself in his best holiday wear. At least it was red. She gave me the most precious "i'm not looking directly AT the camera pose!" We gave it a shot and I'm thrilled beyond belief. It's our kind of perfect! I LOVE the eye roll. The picture turned out great. Sometimes I think a candid is the best picture of all. Beautiful children! Our photos were taken long before the digital era - I used to go through 2-3 rolls of film and hope to find one that was decent. 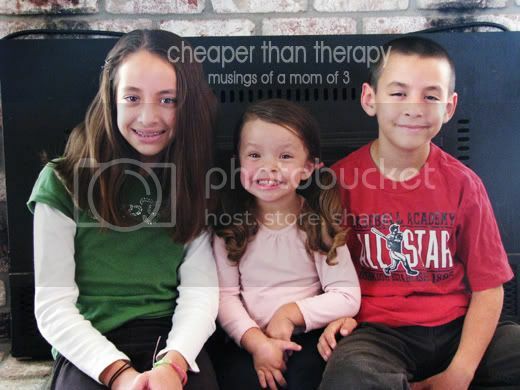 The math works like this - 3 kids are 9 times more difficult to photograph than 2. And as the got older at least one would always say "I don't like the way I look in that picture!" Oh, what fun! I think I still have boxes of "unselected" photos in the basement. how cute?! I am still coercing my girls to sit together.....I will have to catch them on a good day! I totally think the one with the eye roll was used at the Cheeze house when she was a little girl...me at my sister, of course, not the other way around because little sisters are soooooo wonderful! All your kids are cute, but the littlest one is adorable!!! Jen they are BEYOND cute!!! I LOVE the eye roll-your babies are beautiful and Handsome! Love them! And that K...she could be an actress! OMG!!! They are adorable!!! That one is so funny where she rolling her eyes. And it's stretched out, not stressed. Remember? I am a believer (and lover) of real pictures. The un posed, showing the kids personality. Love it. Very cute! Are you going to do a collage or just the last one? Because the others are super cute too! I posted mine today as well! Makes me feel great about my pictures. At least K smiles. Mikayla won't for the life of me. they came out great; cute cute kids! I can't believe how big K looks, and your boy is looking like a big boy too! And, well, DQ is so starting to look teenagerish! Those are all great pictures. K's hair is fabulous! I would love those locks... Don't stress, it will pass, and look at the little gifts you already have! I think it turned out great! Very cute! We took about 150 in one night in an attempt to get a good one. THe G-man doesn't sit still and would from time to time throw things at the camera. Good thing it's digital! They are super cute! 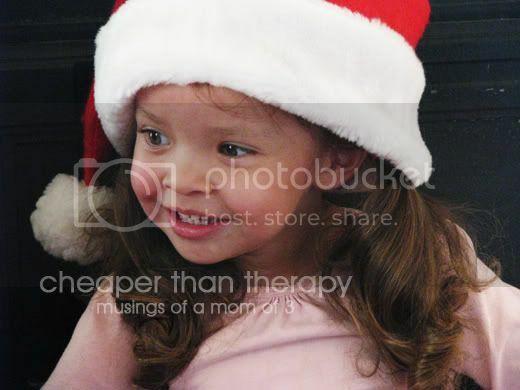 I love that solo shot of the littlest one - so sweet! Very cute pictures!! Your little one has so much personality...its so cute! Oh yeah they're cute! Great pic - it is just perfect. Happy Holidays Jen! Oh and I have to admit the eye-rolling is pretty darn cute too! awww. they are so sweet!! How very cute. I can see you have much to be thankful for. Merry Christmas. Thos are great pictures! 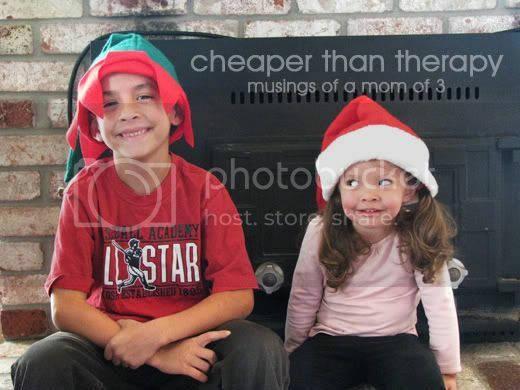 I can't imagine trying to get my two to cooperate, much less 3 or more :) I say good job!! Love the one of your daughter rolling her eyes at brother..heh! They are all precious, but that little one looks like a perfect little IMP! Oh but it IS perfect! Nice job Momma...you did it! I'm jealous actually....how the heck am I going to pose a 16 month old and 4 month old - together???? A fiasco for this weekend when Daddy can help I think. Very cute! Thank goodness for digital cameras, huh? I love them all, so cute. Your children are all so adorable.. I love it and the out- takes! Super cute. You should do a collage of the photos. Pics are adorable, just like your kidlets! But, where are you and the hubsters? You all are such a fab looking fam! They are way cute, and K just steals the show. That is perfect. Adorable! 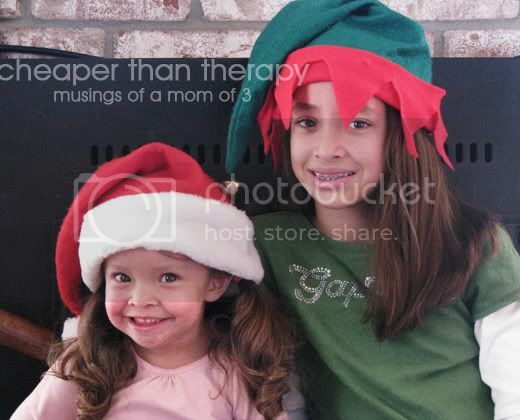 I used to take the cutest Christmas card pics when I had only two kiddos...with three it is impossible! I love the pics! They're so cute!! Ha Ha HA, love K's eye roll! they are adorable! i love the "not looking" look!!! LOL!! They ARE super cute! Great shot! K's hair is beautiful! I love them and they are perfect!! Those are ALL adorable and perfect in my eyes. Love the final result too-so sweet. You have three gorgeous babies. Great shot! I love K's smile - what a little ham! I love these photos! They so say "family!" Such Cuties! Love Love Love the eye roll picture! Oh that little K looks like a handful! I'm amazed you got a shot--- I am posting my attempts at xmas photos on Thursday, as I do not have 1000 expletives to cover the frustration I experience trying to capture them all looking semi-decent. Bah humbug! they are gorgeous! The pics came out great! I'm with ya in the stress department. We've been talking about THE photo...but have yet to try it. gives me the same feeling as walking into huaunted house. Beautiful kids!!! Great pictures! I think the rule is all in the photo and if possible no tears! They are all so cute! And look just like you! They are way cute!!! We are doing our Family pics this weekend. God help us, so that it wont turn ugly around here. None of us like having our pics taken except the little one. SO adorable. I'm ALL about the non-traditional picture. Love it. Adorable kids. I love the second picture where she is rolling her eyes. Too cute! Cute!!! Your kind of perfect is my kind of perfect! Jen, your kiddos are so cute! i would love the eye rolling photo, adorable!! merry xmas! I love the eye roll. Love the out takes! So cute. Really love that last one, though. Love those pics!!! Can I be on your christmas card list!? LOL That eye rolling one was the best! I just love K's smile...what a doll! Great pictures! Well, there's always PhotoShop, right? I love the photo with the eyeroll - too cute! Oh, they are very cute! I'm still glad I can make my girl wear whatever I want - but I'm SO looking forward to making her look at the camera and smile! Right now, we have to take whatever we can get! It's perfect; their personalities shine through that last shot the best :) Love it. OMG - these photos are AWESOME!!!!!! Wow - your kids are beautiful.